Villa UJV 209, also known as La Rose des Vents, is a contemporary four bedroom, four bathroom, villa with a pool, Jacuzzi, and fitness room. 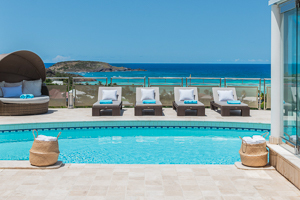 This stylish villa offers a sensational view of the lagoon at Grand Cul de Sac, St Barts. The white décor, cathedral ceilings, and open-floor plan lend an airy ambiance to villa UJV 209. The indoor living room and fully-equipped kitchen open out to an outdoor living and dining area, which lie behind the large pool and sunny terrace. Three equal queen bedrooms with ensuite bathrooms are on the main level. The fourth queen bedroom, located in a separate pavilion, is accessed by stairs leading down to it. The extended terrace is ideal for relaxing on the lounge chairs, or for sunbathing near the pool. The wonderful breezes keep the mosquitos at bay.